The opening ten minutes of BPM (Beats per Minute) (an inscrutably poor re-titling of the original French title, which translates as 120 Beats per Minute) are among the most bracing and original in any movie I've seen in 2017. Before we're given a minute to situate ourselves, we're dumped into the backstage area where a man is giving a talk, just barely seen in a slice of light behind a curtain, nor has he been miked clearly enough to pick out what he's saying without straining a little bit. Meanwhile, a group of people, mill around in silhouette. And then a different, offscreen voice calls out "let's go" - and then the film slams into its title card. We then skip ahead to the latest weekly meeting of ACT UP Paris, where four new members are being given the rules of conduct that attempt to make sure that everyone involved in that activist group working to increase knowledge and find medical treatment in the depths of the early 1990s AIDS crisis, has an opportunity to make their voice and concerns heard, without any individual being given undue authority. And then it's straight into an attempt to deconstruct what happened during their most recent protest act against the useless government organisation that has been put in place to deal with the AIDS crisis, where "deal with" is an obvious euphemism for "make it look like we care without necessarily having to go to the trouble of doing any work". As we learn within a few seconds, that dizzying opening scene was the site of ACT UP's latest work, and things got a bit gnarled up almost from the moment it started. In best Rashomon style, the film lets a few different activist share their impression of what happened, and in so doing, reveals the schism that is starting to bubble up in the group, between the people who want to remain studiously nonviolent and open to discussion, and the people who want the group's already aggressive protest acts to become more intense still in threatening the comfortable status quo. And whatever the group's lip service to perfect democracy might be, there's also obviously a segment that considers de facto leaders Thibault (Antoine Reinartz) and Sophie (Adèle Haenel) to be growing a little to comfortable about telling everyone else what to do. It's equal parts political message movie, thriller, and docudrama, and it's an unmitigated triumph. It's always a little disappointing when a movie peaks in its opening scene, even more so when a film has as much movie left to go after its opening scene as the 140-minute BPM. That being said, a very long stretch of that 140 minutes remains in mostly the same mode that makes that opening sequence so superb. This is, for well over half of its running time, primarily a story about how an organisation like ACT UP can hang together and operate while being pulled in two different directions by equal and opposite pressures: the sharp and sometimes acrimonious disagreements between ACT UP members on how the group should exist in society; and the sure and certain knowledge that even with these disagreements, these people are all each other's best and only allies in the face of indifference or hostility from the rest of the world. It focuses with perfectly absorbed attention on the minutiae of running meetings and fruitlessly debating tactics; it contrasts the emotional high of actually being able to get stuff done on the streets with the frustration not seeing whether any of that work is actually changing hearts and minds, let alone speeding up the process of getting pharmaceutical companies to treat them as humans rather than as potential sites for profit. It is a message movie and a story about group processes, and a film about a collective, and that is unbelievable fascinating; it's like the meeting scenes in a Frederick Wiseman documentary turned towards scripted narrative, and while I understand that not everybody would find that a big selling point (I understand as well that not everybody would understand what the hell I just even said). It is, nonetheless, quite a high wire act, trying to make a narrative centered around a group as a group, rather than as the sum of its individuals. Indeed, it's such a high wire act that BPM ends up falling. 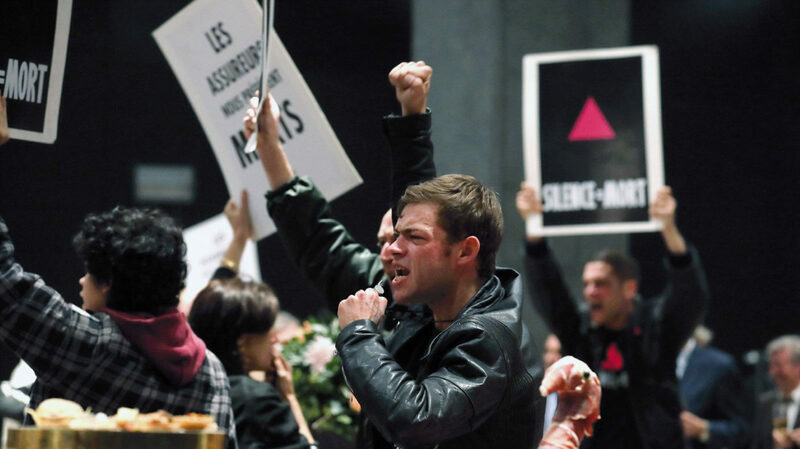 No dishonor to director Robin Campillo and co-writer Philippe Mangeot, who drew upon their own experiences with ACT UP in assembling this story, and who evidently desired to make BPM not just a story of ACT UP in the early 1990s, but a top-to-bottom story of every aspect of the AIDS crisis in France, down to the story of how HIV-negative ACT UP member Nathan (Arnaud Valois) and HIV-positive Sean (Nahuel Pérez Biscayart) navigate the difficulties of their burgeoning relationship, which grows complicated as Sean decides to sever his connection to ACT UP over disagreements with Thibault, right as his illness enters its last stages. About 80 or 90 minutes into the film, this plotline goes from something flickering in the background to the solitary focus of the film. And, I hate to be churlish, but it simply doesn't work - setting aside the issue of movies about gay civil rights always turning into the story of cute twinks in love (and BPM has a notable problem with that - there's one transwoman and two non-white characters who combine for a total of maybe five lines of dialogue; the transwoman in particular feels like the screenwriters were checking off a box), BPM is interesting and effective precisely because it takes such a singular focus on one narrow aspect of how social activist groups function and don't function. I don't know, maybe if it teased earlier on that it was going to start narrowing its focus, it would be a little easier to take it, but the shift happens fast, decisively, and without warning. This could work. It just doesn't work. Regardless, the majority of the film's running time is quite marvelous, if a little bit hemmed in by a banal visual language - wide group shots, medium close-ups of people talking, damn little else. Though I do admire the slight blue tint to everything we see, which is probably not a nod to Derek Jarman's masterful 1993 Blue, his own meditation on dying of AIDS, but I am pleased to assume that it might be. Campillo's staging of ACT UP's work is hectic and kinetic, moving with lightning speed through moments of that cover both the fear and excitement of activist work (a raid on a pharmaceutical company's offices, armed with balloons of fake blood, covers us for tension; a scene passing out leaflets in a school, and the wildly divergent attitudes of different teachers, as well as the students, is pretty well exciting; it's also my favorite scene in the film, after its bravura opening). The film is paced well, whatever else is true about its structure. All of this aside, it's a worthy movie, if lumpy. ACT UP's best cinematic tribute remains the excellent 2012 documentary How to Survive a Plague, but this is a fine #2; it's minutely observed and filled with the raging passion of youth, clearly personal even at its most communitarian. The peculiar storytelling choices are hard to overlook, but the film's sense of social urgency goes a long way to explaining its Grand Prix win at Cannes, and its general critical adulation; it's a hell of an admirable movie, no matter what else.